The humming sound of busy honeybees filled the fall air, darting back and forth as I followed longtime beekeeper Randy Oliver around his bee yard. I was there to learn about a new issue for local beekeepers. Oliver explained that local honeybee colonies have been robbed of their honey in places they have been kept year-after-year for several decades. Robbed?? Yes, by other honeybees, from hives from other parts of California. In the last couple years, numerous out-of-area hives have been placed in close proximity to local hives. Oliver, along with local beekeepers, presented a draft proposal to the Nevada County Ag Advisory Commission, which recommended an emergency beekeeping ordinance to county supervisors. 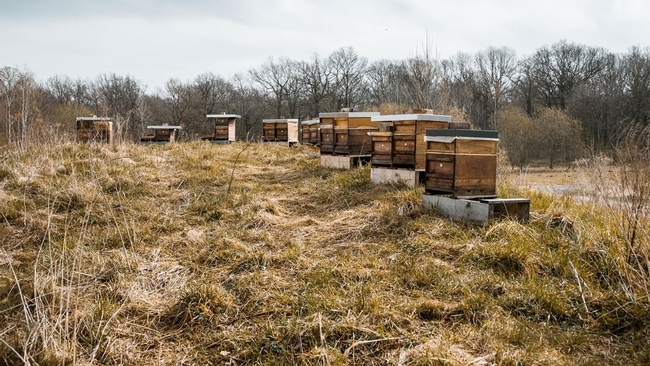 Oliver explained that the proposal calls for a minimum of a 2-mile radius around each existing apiary location and a 45-hive maximum in each location. All bee hives in Nevada County must be registered by the Ag Commissioner in January each year. This ordinance is designed to provide the resources and “teeth” to protect local bees and their food sources. Put in rancher terms, imagine that you had your cattle on pasture, someone saw your cattle grazing and decided to dump off 100 cows in the same pasture because it looked like a good food source. “This is beekeepers regulating themselves” said Oliver. The ordinance would not cost taxpayers and is funded by beekeepers themselves. Hobby beekeepers would be exempt from the registration fees and existing hives would be grandfathered in. Another issue with having bee colonies in close proximity is the potential for infection and mite drift into hives. Oliver explained the dangers of reintroducing a bacterial disease called American foulbrood that is nearly eradicated in Nevada County. This issue may also be of concern in Placer County. So what does this have to do with local farmers and ranchers? If someone asks permission to put honeybee hives on your land, or leaves a note on your gate, contact your Nevada County Beekeepers Association or search “Honey” on the Placer Grown website to find local beekeepers. A report released in March by the National Agricultural Statistics Service (NASS) stated that California produced 13,735,000 pounds of honey in 2017, worth more than $28.5 million dollars. Beekeeping is an important agricultural activity in this area. Hive rentals to almond growers rather than honey provide the major income for beekeepers, but honey is an important product in the foothills.